The little town of Casale, now known as Casale Monferrato, in northwest Italy was the capital of the Marquisate of Monferrat when Jews first settled there in the 1430s. During the seventeenth century, when the town was ruled by Gonzaga dukes, there were 500 to 600 Jews in Casale. Despite its small size, the community erected a magnificent synagogue in 1595, and sponsored fine ceremonial objects and beautiful ketubbot. 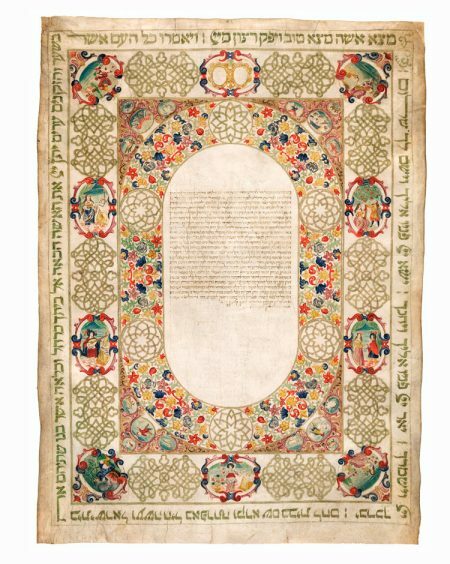 The text of this ketubbah has two sets of frames. The inner is shaped as a wide oval crowded with colorful flowers, interspersed by six, symmetrically arranged, gilded rosettes. At each corner around the frame are four medallions; the central and largest in each group is an allegorical depiction of one of the Aristotelian elements: Air, as a sailing ship; Water, as water drawn from a fountain; Fire, as Mount Sinai in flames, topped by the Tablets of the Law; and Earth, by a man sowing seed. Grouped in units of three around each element are depictions of the Signs of the Zodiac, beginning at the lower right corner with Aries, the symbol of Nisan, the first month in the Hebrew calendar, and continuing counterclockwise around the border. The outer frame is dominated by gilt knot motifs that alternate with ten cartouches. The elaborate interlace patterns, or strapwork, a central motif in the decoration of Italian ketubbot, represent “love knots” that have no beginning and no end. The cartouches in the four corners depict allegories of the Four Seasons: Summer, as a woman harvesting wheat; Fall, as a farmer in the field; Winter, as a man warming his hands by a fire; and Spring, as a woman seated in a flourishing garden. Completing the decorative program, the side medallions portray allegorical representations of the Five Senses: Sight, as a woman looking in a mirror; Hearing, as a man playing a mandolin; Smell, as a woman smelling flowers; Taste, as a couple about to eat an apple; and Touch, as a couple holding one another’s hand. The tenth cartouche, at the top, intended for family crests, was never filled in.